A Siemens steam turbine with the case opened. A turbine is a rotary engine that extracts energy from a fluid flow. The simplest turbines have one moving part, a rotor assembly, which is a shaft with blades attached. Moving fluid acts on the blades (or the blades react to the flow), so that they rotate and impart energy to the rotor. Gas, steam, and water turbines have a casing around the blades that contains and controls the working fluid. Examples of early turbine are windmills and water wheels. Turbines are often part of a larger machine. Nearly all of the electrical power humans generate and consume is produced with a turbine of some type. Most jet engines rely on turbines to supply mechanical work from their working fluid and fuel, as do all nuclear ships and power plants. Claude Burdin (1788-1873) coined the term turbine from the Latin word turbo, meaning "vortex," during an 1828 engineering competition. Benoit Fourneyron (1802-1867), a student of Claude Burdin, built the first practical water turbine. Credit for invention of the modern steam turbine is given to British Engineer Sir Charles Parsons (1854 - 1931). A device similar to a turbine but operating in reverse is a compressor or pump. The axial compressor in many gas turbine engines is a common example. These turbines change the direction of flow of a high velocity fluid jet. The resulting impulse spins the turbine and leaves the fluid flow with diminished kinetic energy. There is no pressure change of the fluid in the turbine rotor blades. Before reaching the turbine the fluid's pressure head is changed to velocity head by accelerating the fluid with a nozzle. Pelton wheels and de Laval turbines use this process exclusively. Impulse turbines do not require a pressure casement around the runner since the fluid jet is prepared by a nozzle prior to reaching turbine. Newton's second law describes the transfer of energy for impulse turbines. These turbines develop torque by reacting to the fluid's pressure or weight. The pressure of the fluid changes as it passes through the turbine rotor blades. A pressure casement is needed to contain the working fluid as it acts on the turbine stage(s) or the turbine must be fully immersed in the fluid flow (wind turbines). The casing contains and directs the working fluid and, for water turbines, maintains the suction imparted by the draft tube. Francis turbines and most steam turbines use this concept. For compressible working fluids, multiple turbine stages may be used to harness the expanding gas efficiently. Newton's third law describes the transfer of energy for reaction turbines. Turbine designs will use both these concepts to varying degrees whenever possible. Wind turbines use an airfoil to generate lift from the moving fluid and impart it to the rotor (this is a form of reaction). Wind turbines also gain some energy from the impulse of the wind, by deflecting it at an angle. Crossflow turbines are designed as an impulse machine, with a nozzle, but in low head applications maintain some efficiency through reaction, like a traditional water wheel. 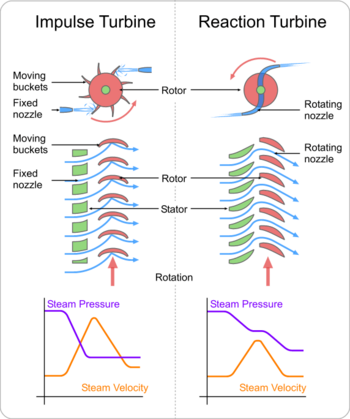 Turbines with multiple stages may utilize either reaction or impulse blading at high pressure. Steam Turbines were traditionally more impulse but continue to move towards reaction designs similar to those used in Gas Turbines. At low pressure the operating fluid medium expands in volume for small reductions in pressure. Under these conditions (termed Low Pressure Turbines), blading becomes strictly a reaction type design with the base of the blade solely impulse. The reason is due to the effect of the rotation speed for each blade. As the volume increases, the blade height increases, and the base of the blade spins at a slower speed relative to the tip. This change in speed forces a designer to change from impulse at the base, to a high reaction style tip. Classical turbine design methods were developed in the mid-nineteenth century. Vector analysis related the fluid flow with turbine shape and rotation. Graphical calculation methods were used at first. Formulas for the basic dimensions of turbine parts are well documented and a highly efficient machine can be reliably designed for any fluid flow condition. Some of the calculations are empirical or "rule of thumb" formulae, and others are based on classical mechanics. As with most engineering calculations, simplifying assumptions were made. Steam turbines are used for the generation of electricity in thermal power plants, such as plants using coal or fuel oil or nuclear power. They were once used to directly drive mechanical devices such as ship's propellors (for example, the Turbinia), but most such applications now use reduction gears or an intermediate electrical step, where the turbine is used to generate electricity, which then powers an electric motor connected to the mechanical load. Transonic turbine. The gasflow in most turbines employed in gas turbine engines remains subsonic throughout the expansion process. In a transonic turbine the gasflow becomes supersonic as it exits the nozzle guide vanes, although the downstream velocities normally become subsonic. Transonic turbines operate at a higher pressure ratio than normal but are usually less efficient and uncommon. This turbine works well in creating power from water. Contra-rotating turbines. Some efficiency advantage can be obtained if a downstream turbine rotates in the opposite direction to an upstream unit. However, the complication may be counter-productive. Statorless turbine. Multi-stage turbines have a set of static (meaning stationary) inlet guide vanes that direct the gasflow onto the rotating rotor blades. In a statorless turbine the gasflow exiting an upstream rotor impinges onto a downstream rotor without an intermediate set of stator vanes (that rearrange the pressure/velocity energy levels of the flow) being encountered. Ceramic turbine. Conventional high-pressure turbine blades (and vanes) are made from nickel-steel alloys and often utilize intricate internal air-cooling passages to prevent the metal from melting. In recent years, experimental ceramic blades have been manufactured and tested in gas turbines, with a view to increasing Rotor Inlet Temperatures and/or, possibly, eliminating air cooling. Ceramic blades are more brittle than their metallic counterparts, and carry a greater risk of catastrophic blade failure. Shrouded turbine. Many turbine rotor blades have a shroud at the top, which interlocks with that of adjacent blades, to increase damping and thereby reduce blade flutter. Shroudless turbine. Modern practice is, where possible, to eliminate the rotor shroud, thus reducing the centrifugal load on the blade and the cooling requirements. Wind turbine. These normally operate as a single stage without nozzle and interstage guide vanes. An exception is the Éolienne Bollée, which has a stator and a rotor, thus being a true turbine. Velocity compound "Curtis." Curtis combined the de Laval and Parsons turbine by using a set of fixed nozzles on the first stage or stator and then a rank of fixed and rotating stators as in the Parsons, typically up to ten compared with up to a hundred stages, however the efficiency of the turbine was less than that of the Parsons but it operated at much lower speeds and at lower pressures which made it ideal for ships. Note that the use of a small section of a Curtis, typically one nozzle section and two rotors is termed a "Curtis Wheel"
Pressure Compound Multistage Impulse or Rateau. The Rateau employs simple Impulse rotors separated by a nozzle diaphragm. The diaphragm is essentially a partition wall in the turbine with a series of tunnels cut into it, funnel shaped with the broad end facing the previous stage and the narrow the next they are also angled to direct the steam jets onto the impulse rotor. Almost all electrical power on Earth is produced with a turbine of some type. Very high efficiency turbines harness about 40 percent of the thermal energy, with the rest exhausted as waste heat. 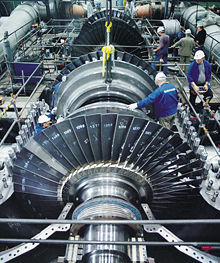 Turbines are often part of a larger machine. A gas turbine, for example, may refer to an internal combustion machine that contains a turbine, ducts, compressor, combustor, heat-exchanger, fan and (in the case of one designed to produce electricity) an alternator. However, it must be noted that the collective machine referred to as the turbine in these cases is designed to transfer energy from a fuel to the fluid passing through such an internal combustion device as a means of propulsion, and not to transfer energy from the fluid passing through the turbine to the turbine as is the case in turbines used for electricity provision, among other uses. Reciprocating piston engines such as aircraft engines can use a turbine powered by their exhaust to drive an intake-air compressor, a configuration known as a turbocharger (turbine supercharger) or, colloquially, a "turbo." Turbines can have very high power density (that is, the ratio of power to weight, or power to volume). This is because of their ability to operate at very high speeds. The Space Shuttle's main engines use turbopumps (machines consisting of a pump driven by a turbine engine) to feed the propellants (liquid oxygen and liquid hydrogen) into the engine's combustion chamber. The liquid hydrogen turbopump is slightly larger than an automobile engine (weighing approximately 700 lb) and produces nearly 70,000 hp (52.2 MW). Turbines could also be used as powering system for a remote controlled plane that creates thrust and lifts the plane off the ground. They come in different sizes and could be as small as soda can, still be strong enough to move objects with a weight of 100 kg. An emerging renewable energy technology is the shrouded tidal turbine enclosed in a venturi shaped shroud or duct producing a sub atmosphere of low pressure behind the turbine, allowing the turbine to operate at higher efficiency (than the Betz limit of 59.3 percent) and typically 3 times higher power output than a turbine of the same size in free stream. A downstream low pressure draws upstream flow into the inlet of the shroud from well outside the inlet of the shroud. This flow is drawn into the shroud and concentrated. This augmentation of flow velocity corresponds to a 3-4 fold increase in energy available to the turbine. Therefore a turbine located in the throat of the shroud is then able to achieve higher efficiency, and an output 3-4 times the energy the turbine would be capable of if it were in open or free stream. For this reason, shrouded turbines are not subject to the properties of the Betz limit. Considerable commercial interest has been shown in recent times in shrouded tidal turbines as it allows a smaller turbine to be used at sites where large turbines are restricted. Arrayed across a seaway or in fast flowing rivers shrouded tidal turbines are easily cabled to a terrestrial base and connected to a grid or remote community. Alternatively, the property of the shroud that produces an accelerated flow velocity across the turbine allows tidal flows formerly too slow for commercial use to be utilized for commercial energy production. While the shroud may not be practical in wind, as a tidal turbine it is gaining more popularity and commercial use. A shrouded tidal turbine is mono directional and constantly needs to face upstream in order to operate. It can be floated under a pontoon on a swing mooring, fixed to the seabed on a mono pile and yawed like a wind sock to continually face upstream. A shroud can also be built into a tidal fence increasing the performance of the turbines. Cabled to the mainland they can be grid connected or can be scaled down to provide energy to remote communities where large civil infrastructures are not viable. Similarly to tidal stream open turbines they have little if any environmental or visual amenity impact. ↑ North Dakota State University, Perfect Turbine Performance. Retrieved September 25, 2008. ↑ Brian Kirke, Developments in ducted water current turbines. Retrieved September 25, 2008. Boyce, Meherwan P. 2006. Gas Turbine Engineering Handbook, 3rd edition. Boston: Gulf Professional Pub. ISBN 978-0750678469. Kehlhofer, Rolf H., et al. 1999. Combined-Cycle Gas & Steam Turbine Power Plants, 2nd edition. Tusla, OK: PennWell. ISBN 0878147365. Kiameh, Philip. 2003. Power Generation Handbook: Selection, Applications, Operation, and Maintenance. New York: McGraw-Hill. ISBN 0071396047. Shlyakhin, Pavel N. 2005. Steam Turbines: Theory and Design. Honolulu: University of Hawaii Press. ISBN 978-1410223487. How Gas Turbine Engines Work. HowStuffWorks. This page was last modified on 23 December 2015, at 22:15.